This month North Coast Creations is releasing three beautiful vintage Floral Sets: Floral Sentiments, Floral Sentiments 2 and Floral Sentiments 3. Continue reading below to find out how you can win one of two North Coast Creations $10 Gift Certificates good towards the purchase of NCC Stamps. My first card features the floral image from North Coast Creations Floral Sentiments 3 stamp set along with the sentiment from Floral Creations 2 and ODBD Custom Antique Labels and Border Die. The floral image is stamped in Black Archival on Vanilla card stock, then colored with STAEDTLER Kara Aquarell Watercolor Markers. I stamped and colored the image multiple times, cut the blossoms will scissors and used the Paper Tole Technique to add dimension to the flowers. I used a SAMJ to add the sentiment in Black Archival. All panels are sponged with Ranger Gathered Twigs Distress Ink. To embellish I added Vintage Red Seam Binding and some Robin's Nest Dew Drops. The image and sentiment are stamped in Black Archival on White card stock and die cut with Spellbinders Circle Dies, layering the panels on Black die cut circles. The floral image was paper pieced with Bo Bunny Pincushion pattern paper and Pistachio card stock. To embellish I added Robin's Nest Dew Drops. 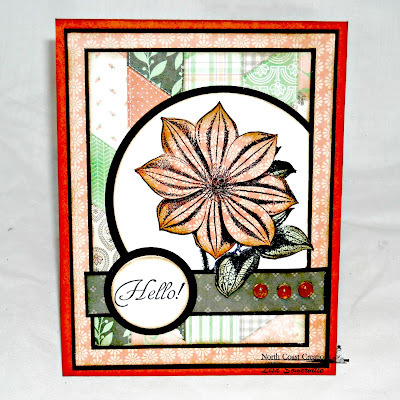 Two randomly selected winners will each receive a $10 gift certificate to North Coast Creations, good towards the purchase of NCC stamps, just for commenting on the Design Team cards! You have until Friday, January 17th, at 10:00pm EST to leave your comments. Winners will be posted January 18th, on the North Coast Creations Blog, so be sure to check back there to see if you are one of the winners! 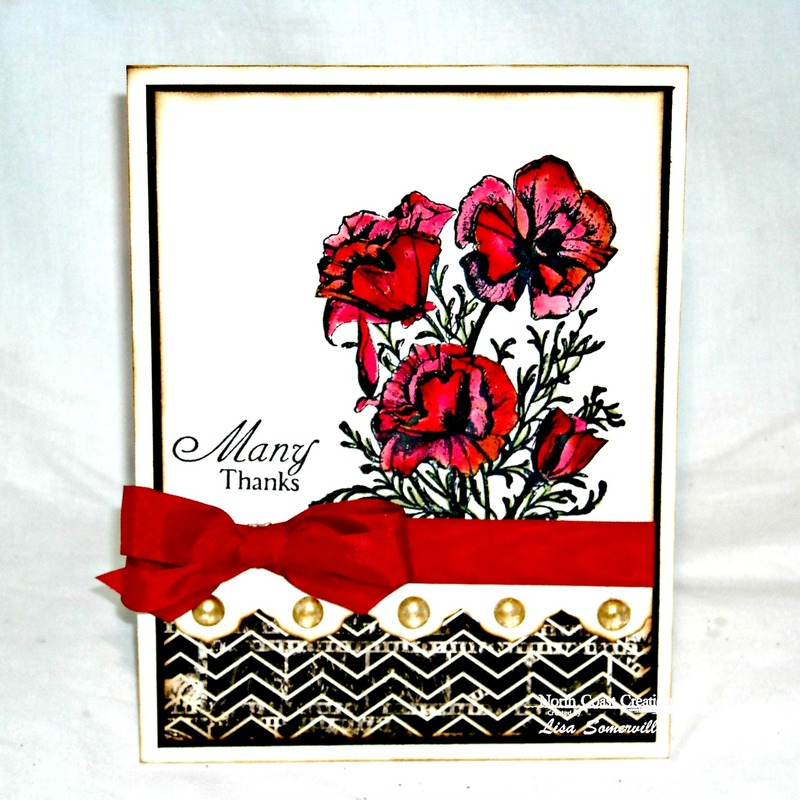 Gorgeous cards, Lis! 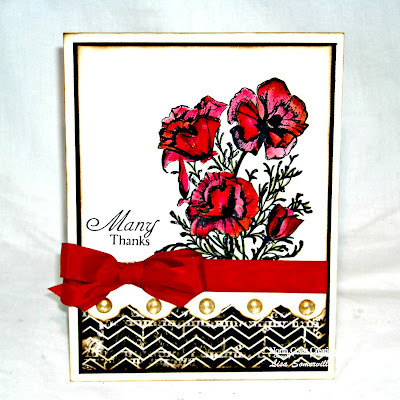 Love the beautiful poppies and yummy bow on the first and love the paper pieced flower of the 2nd! Fabulous job! HUGS!! Beautiful! Love the patchwork feel on the 2nd project and that bow on the first is fabulous! Your coloring is always spot on! Beautifully done! Very pretty cards. Love the colors and design of the first - gorgeous and the paper piecing is a great idea in the second card. lovely samples, Lis! I'm just in love with that first one, stunning! Two lovely cards. Beautiful colors of the first card. Love the brilliant colors. Very professional looking cards. How beautiful Lisa! 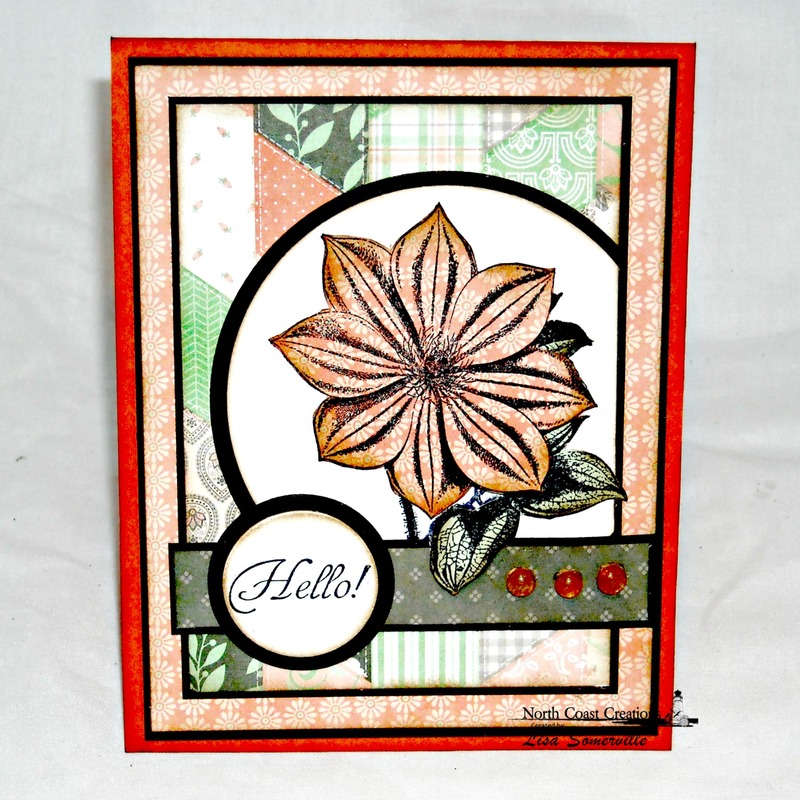 I love your coloring on both cards but I am drawn to the dahlia card! Gorgeous! So very pretty cards! It would be great to learn from you!! Thanks for sharing!!! I heart both of these beauties! I heart these stamps too! Love anything vintage and these stamps are great. Love the cards. Two really pretty cards, Lisa. I haven't ever done paper piercing and I think I may need to look that up and try it. Very pretty cards, I really love the top one, it really pops out at me. Thanks for sharing. Both of these are lovely, Lisa! Love the colors and papers you used. Super layouts, too! Beautiful cards, Lis!! Love the poppy card!